I was born and raised in New Orleans, Louisiana during the first half of the last century, so you know I’m upwards in age. I’m not living there now, but it is a very cool place from which to have grown up and, even as an adult, it was fun. Drive-up daiquiri shops were as plentiful there as drive-up coffee shops where I now live, and although I have been away for 30 years, it is probably still like that. It was even legal to drink and drive. You couldn’t be drunk and drive, but otherwise, you could drive all over town while sipping a beer or other alcoholic drink. Probably not so, today, though. Anyway, it was thinking about this unique social greeting that got me considering how people in the Bible greeted one another. In the Old Testament, the common Hebrew greeting is “shalom” (shālōm: “well,” “prosperity,” “peace”). As an example, Genesis 37:4 says, “But when his brothers saw that their father loved him more than all his brothers, they hated him, and could not speak peaceably to him.”3 The word “peaceably” is translated from shālōm, and means his brethren “could not give him the common friendly greeting of ‘Peace!’”4 As you can see, it is good to know, sometimes, where the Bible words come from, to get the real meaning. 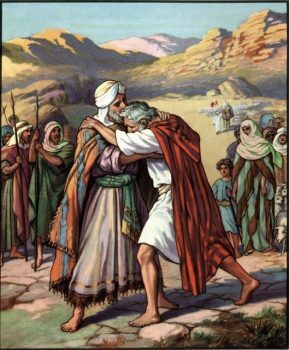 Another example, and a bit easier to understand, is at Exodus 18:7, “Moses went out to meet his father-in-law; he bowed down and kissed him; each asked after the other’s welfare, and they went into the tent.” In this case, “welfare” is also translated from shālōm and means they asked each other how they were doing, as a pleasant greeting, before going inside.5These salutations, upon meeting or parting or in letters, are basically expressions of good wishes; a polite exchange of words meaning “peace be with you.” In some instances, bowing as a sign of respect, or a kiss, was part of the greeting,6 as evidenced in the Old Testament quote above. In New Testament greetings, the translations are from Greek, but are similar in speech style. “Peace to you. The friends send you their greetings. Greet the friends there, each by name.” (3 John 15) Paul opens most of his epistles with a special Christian greeting, too; one example is “The grace of the Lord Jesus be with you. My love be with all of you in Christ Jesus.” (2 Corinthians 16:23-24)7 When greeting in person, a kiss may also be included. The “kiss of peace” is a traditional Christian gesture and sometimes called the “holy kiss.” Such greetings signify a wish and blessing that peace be with the recipient. “It was the widespread custom in the ancient western Mediterranean for men to greet each other with a kiss. That was also the custom in ancient Judea and practiced also by Christians.”9 In fact, even today in many parts of the world, this is a practice among family and friends when greeting at their arrival or departure. The same can be said about bowing to show respect (or a man’s tip of the hat, especially to a lady). Greetings are as common today as they were in ancient times, they only vary a bit from country to country and region to region. Even a greeting such as the one in New Orleans is friendly and concerning, because when someone says “Where Y’at?” they mean “Where are you at (in life)?” — they are basically asking how are you doing or feeling at the current moment; are you okay; are you doing well? In other words, they are concerned with your well being. It is nice to know that when we exchange greetings, either through religious ceremony or because of general tradition, we are sharing our warmest thoughts and hopes with others. 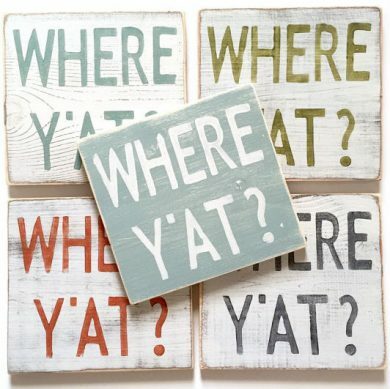 Note: New Orleans English, sometimes referred to as “Yat dialect,” is American English native to the city of New Orleans. Walker, W. L., “Greeting,” (Orr, James, ed. ), The International Standard Bible Encyclopedia, (Chicago: The Howard-Severance Company, 1915), p. 1305. Church, Chris, “Greeting,” ( Brand, Chad, ed. ), Holman Illustrated Bible Dictionary, (Nashville, TN: Holman Bible Publishers, 2003), p. 690. Hey, where y’at, Rev. Been in NOLA for 67 years. Born here and probably will die here. Back atcha, bro. I’ll think of ya when drinking my next frozen daiquiri.